We here at A1 Diabetes focus on providing our patients with the medical equipment they need in a timely and cost effective manner. We also strive to offer the highest level of service possible. Our commitment to meet the needs of our patients is surpassed by no other. Keeping everything as simple as possible for you and your patients is a top priority. 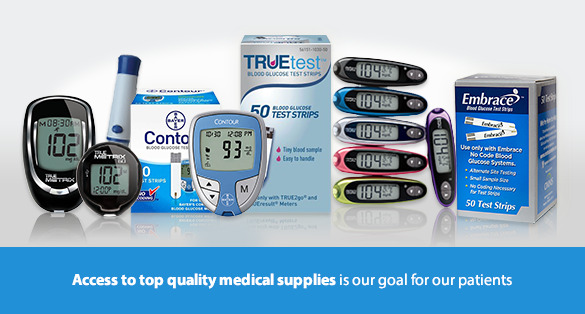 A1 Diabetes offers these supplies every 90 days and ships them absolutely FREE to your door. We also take the headache out of the paperwork for our patients. We bill Medicare on their behalf saving them time and any possibilities of waiting for reimbursements. Medicare takes care of 80% of these costs, and if the patient has secondary insurance, they will pay the remaining 20%... a valuable service that we offer all of our patients at A1 Diabetes.